Many ELT materials are rich in visual images, and most teachers make use of some songs or roleplays in their lessons, offering some relief from the traditional book-based learning. How many of us, though, really scratch deeply enough below the surface to build our teaching around the use of creative arts in deeply meaningful learning activities? The interactive sessions in our PCE all take a creative art form as a starting point and explore its application in the ELT classroom, considering how it can enhance inclusivity. We’ll be looking at ways of using music, drama and storytelling in the language classroom, so get ready to roll up your sleeves and start participating. 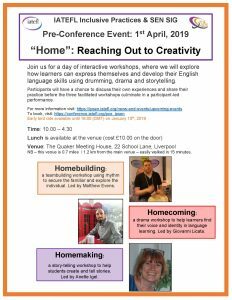 Do you wonder what it might be like to take part in drum workshop? Are you curious but a bit unsure of whether it’s for you? Read what’s it like being in a drumming workshop, Matthew Evens. The central topic of the day is ‘home’: a topic which all learners can relate to, but also have very different views of. This range of experience will be explored and embraced in the three workshops and brought together in a performance with all participants. The day will also include time for the participants to talk about their own practice and share their experiences. 22 School Lane, Liverpool L1 3BT. Delegates will be required to register at the ACC before making their way to the PCE. It is about 3/4 mile (1.2 km) easy walking (about 15-20 miunutes?). Probably you’ll want to use your phone for a map, but you can click here for descriptive walking directions to the QMH between the two venues. Look out for the IP&SEN SIG committee members along the route, too. Lunch and refreshments will be served at the venue, for which there is a charge of £10.00, payable on the door. Please complete the form that you will receive by email, so that we can cater appropriately. “Reaching out with creative arts” – This event has had to be postponed – keeping checking back for the new date. Want to make more (or better) use of drama, comics, story-telling and musical activities in your classroom? Join Anna Pires, Rossie Stone of Dekko Comics, Jane Maria Harding da Rosa and Anette Igel as they show you some great practical ideas that you could use with your learners. If you have an idea for an event and would like the input of the Inclusive Practices and SEN team, just let us know! New dates are being set up for 2019 – watch this space!